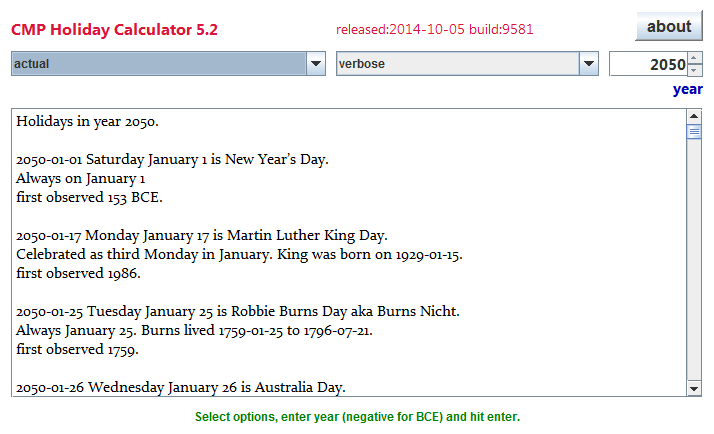 This Applet calculates when various holidays occur in any given year BC or AD. It is designed to be cannibalised to include the calculation routines in your own programs. You might use it to prepare paper calendars well in advance or electronic calendars. You might also use the logic in computer programs that compute payrolls, bus schedules, or club meetings. You might use it in writing novels or researching historical events. It can also be used as an Applet or a standalone application. Many holidays and celebrations occur at the same fixed date each year. Others occur always occur on some special day of the week, or move around wildly, like Easter which is based on the phases of the moon. Others like the equinoxes are based on astronomy. Some events, like presidential inaugurations, don’t happen every year. Some, have moved around over the years. I have posted Java code to calculate to following holidays given the year. You will note these are not all holy-days or holidays you get off work. They are not necessarily even celebrations I use the term holiday very broadly to include any regularly recurring special day on the calendar. The holiday I plan to add next is Chinese New Year which has a complex formula. This Applet below will show you when all the holidays occur in any given year, BC or AD. If the holiday was not celebrated in that year, it will not appear. It will also show you the nearest weekday to any given holiday. Please report any errors via email. If you are willing to provide the rules for calculating your favourite holidays, I will add them too. for the current version of Holiday Calculator. Calculates when various holidays occur in any given year BC or AD. Designed to be cannibalised to include the calculation routines in your own programs. Also calculates the nearest weekday to any given holiday. 3.7MB zip for Holiday Calculator Java source, compiled class files, jar and documentation to run on your own machine either as an application or an Applet. access holidays source in repository with [Tortoise] Subversion client on wush.net/svn/mindprod/com/mindprod/holidays/. download ASP PAD XML program description for the current version of Holiday Calculator. Holiday Calculator is free. Full source included. You may even include the source code, modified or unmodified in free/commercial open source/proprietary programs that you write and distribute. Non-military use only. My least favourite holiday is Remembrance Day/Memorial Day. On that day, otherwise sane card-carrying liberals go gaga over soldiers who participate in illegal aggressive wars. I am not that keen on Easter either. Hypocrites who have nothing to do with religion all year show up to support an obsolete church whose only remaining function is pimping for its paedophilic clergy. As a child, my favourite holiday was Halloween. I liked the fireworks. As an adult, I like the way grown-ups let themselves play by dressing up in silly costumes.